According to Alison Weir, Henry VII was a little twitchy about his descent from John of Gaunt’s notorious mistress (and eventual wife) Katherine de Roët/Swynford. Between them, Gaunt and Katherine produced an illegitimate line of children, the Beauforts, which wasn’t/was/wasn’t legitimate/in line of succession, according to different monarchs. Henry VII was a Beaufort, so you can imagine which side of the argument he was on! Katherine might also have still been married to her first husband, Sir Hugh Swynford, when she conceived the first Beaufort, which was something else to make Henry VII shift uncomfortably. I am only surprised that Henry did not attempt to claim Katherine was descended from King Arthur. Henry was very keen indeed to prove that he and his line were rightful Kings of England because they had Arthur’s blood in their veins. So, Henry Tudor was up to more of his usual meddling tricks? Making sure posterity was recorded as he wanted it recorded? What a surprise. BUT, in one thing Katherine herself signally failed. Her extraordinary beauty did not descend to Henry or his Beaufort mother! Richard’s last Easter in 1485…. Easter is here again, and in these modern times it is only too often thought of as a time of pretty bunnies, fluffy chicks, chocolate eggs, hot cross buns and the joys of spring. But in the past it was a very different occasion, for it was the most important time of the year for the Christian church, because it marked Holy Week. Many of us still regard it in this more solemn light, of course, but what was it like in the time of Richard III? In particular, what did Richard himself do at this particular time? I confess here and now that a lot of what follows has been paraphrased from John Ashdown-Hill’s Last Days of Richard III, in which a great many more details can be found. In 1485, Easter came only a week or so after Queen Anne’s death (Wednesday, 16th March) and Richard must have been feeling bereft and alone. He had lost his son, and now his wife. . .and the king’s Easter duties had to be attended to. I doubt if he felt like doing anything except shut himself away to grieve, but that was not allowed. On Sunday, 27th March, Richard must have appeared in public for the Palm Sunday procession at Westminster. It was the beginning of Holy Week, and Richard had to attend to certain religious obligations, not least the traditional “touching” for the disease known as the King’s Evil, better known to us now as scrofula. The ritual had been enacted in England since at least the time of Henry II, and was not confined to Easter, but Holy Week was the main occasion. English and French kings were believed to have healing hands that could cure sufferers; only for scrofula, not for any other condition. And first, the monarch had confessed, received absolution and taken Holy Communion, so that he was in a state of grace. When each person had received the royal touch (perhaps one of the new gold angels, with the Archangel Michael on one side, and “Per crucem tuam salva nos Christe Redemptor” (“Christ, Redeemer, save us by your cross”) on the other. Richard’s ordeal may not have been as great as those afflicted with this dreadful ailment, but it was bad enough because on Wednesday, 30th March, he had to appear at the Priory of the Knights of St John of Jerusalem (Knights Hospitallers) in Clerkenwell to publicly deny that he intended to marry his niece, Elizabeth of York. And this so swiftly upon Anne’s death. On the first day of the new month of April, Richard performed the penitential rite of ‘creeping to the Cross’. This required him to “prostrate himself, and then—without getting up, “slowly approach the symbol of the crucifixion” in a semi-prostrate condition. There was more, but this is enough to show how much was demanded of the monarch during Holy Week. And in this particular year, 1485, it must have been particularly harrowing for Richard. It was also the last time he would ever see Easter, for on 22nd August that year he died at Bosworth. Edward, Duke of Aumale, highest ranking of the accused, was the elder son of the Duke of York, and was thus first cousin to both Richard II and Henry IV. Despite his relative youth (26 in 1399) he had been high in Richard’s counsels since the early 1390s and had received an astonishing array of offices from the king, being, among other things, at one point both Lord High Constable and Lord High Admiral. A devious man of considerable ability, described by one chronicler as a ‘second Solomon’, his contribution tends to be underrated by historians. He was also a survivor. Despite involvement – or alleged involvement – in several plots against Henry IV, he was to survive long enough to be the leading English casualty of Agincourt. Nevertheless, in the Parliament of late 1399 he had a most torrid time. It is likely that Richard II intended Edward to be his heir. John Holland, Duke of Exeter was King Richard’s half-brother – they shared the same mother, Joan of Kent. He was married to Henry IV’s sister, Elizabeth of Lancaster. Exeter was at this time in his late 40s. He had not always been a strong supporter of Richard, and had at one point been quite closely associated with his father-in-law. However, during the 1390s he had become increasingly important as a member of Richard’s inner circle. Thomas Holland, Duke of Surrey was Exeter’s nephew, the eldest son of Thomas Holland, late Earl of Kent. Another relatively young man, he had recently replaced his deceased brother-in-law, Roger Mortimer, Earl of March (killed 1398) as Lieutenant of Ireland. He had also replaced Aumale as Lord High Admiral. John Montagu (or Montacute) Earl of Salisbury, who was in his late 40s, had only succeeded to his uncle’s earldom in 1397, having been for many years merely Sir John Montagu. His uncle had alienated many of the family estates – there was bad blood between them – and Salisbury was by some way the least wealthy of the accused. Nor had he received any particular rewards in land from King Richard. Acting as Richard’s ambassador to France, he had been unfortunate enough to earn Henry Bolingbroke’s personal enmity because of the message he had brought to Charles VI on Richard’s behalf – which was essentially that Henry should be treated as persona non grata. Salisbury was known to be a Lollard – an early Protestant – and attracted some hostility for that reason. King Richard himself was generally hostile to the Lollards but nevertheless tolerated Salisbury and a few other followers of that movement at his court. Thomas Despenser, Earl of Gloucester was married to Constance of York and was thus Aumale’s brother-in-law and the Duke of York’s son-in-law. 26 years old at this time, he had commanded King Richard’s rearguard in the 1399 campaign in Ireland and been one of the king’s strongest supporters during the upheaval of 1397. Even without the rewards given to him in 1397, he was a very wealthy man, in terms of landed income much more so than his father-in-law. The jewel in his crown was the very valuable Marcher Lordship of Glamorgan. They had all served as ‘counter-appellants’ in 1397, when Richard II had taken his revenge on his uncle, Thomas of Woodstock, Duke of Gloucester and the earls of Arundel and Warwick. All, except Salisbury, had received generous grants of forfeited lands. All except Despenser (Gloucester) and Salisbury had also participated in the partition of the Lancastrian estates earlier in 1399. As a group, they were very much Richard’s ‘Party’ and it cannot be denied that most of them had been very handsomely rewarded for their loyalty. Apart from Salisbury they were all closely linked to Richard by blood or marriage or both. The outcome of the trial – to cut a long story short – was that the accused lost the lands granted to them in 1397 and those who had received upgraded titles (everyone except Salisbury) lost them and reverted to their pre-1397 status. For the purpose of this article, I shall continue to refer to them by their Ricardian titles, to avoid unnecessary confusion. The group were placed into the temporary custody of the Abbot of Westminster, who was a Ricardian himself. It appears that they immediately began to conspire against Henry, although on the face of it the King meant to rehabilitate them fairly quickly. With the exception of Salisbury – against whom Henry maintained a rather obvious grudge – they were, for example, very quickly restored to the Council. Edward of Aumale even received confirmation of some valuable land grants, including the Lordship of the Isle of Wight. Of course, Edward was rather a special case, being the King’s cousin, and perhaps more importantly, York’s son. The Duke of York (who had been Richard’s Keeper of England during the King’s absence in Ireland) had given Henry quite strong support, almost from the minute he surrendered to him near Berkeley Castle a few months earlier. In addition, Edward had not been aligned politically in quite the same way as the others. Richard divided his army in Ireland – allegedly on Edward’s advice – sending the smaller portion to North Wales under Salisbury while returning himself to South Wales with the remainder. When Richard broke up his army near Carmarthen he actually left Aumale behind, possibly fearing that his cousin was no longer reliable in view of the defection of the Duke of York at Berkeley. It seems likely that this defection was a principal cause – if not the main cause – of the King’s panic and his decision to join Salisbury in North Wales. (This decision led to the collapse of his cause and his eventual capture by Bolingbroke.) The other lords involved were all with the King to the bitter end. A note on sources. The main sources for the Epiphany Rising are Walsingham and Traison et Mort. Both have their issues. Walsingham (though used as a principal source for the reign) is hopelessly biased against Richard II, and frequently reports rumours, however ridiculous, if they tend to Richard’s discredit. He can not infrequently be caught out in direct falsehoods. Traison, on the other hand, was written by a French member of Queen Isabelle’s household. 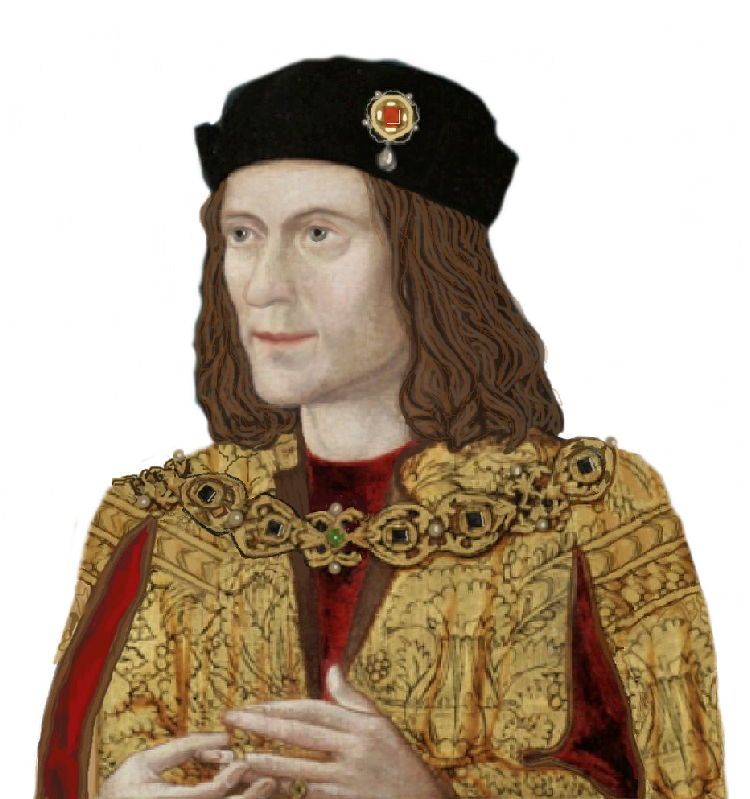 He is heavily biased towards Richard, tends to blame Edward of York for the King’s downfall, and reports details of matters of which he cannot possibly have had direct knowledge, such as the manner of Richard’s death. At the same time, a number of risings were to be provoked across England, and King Richard was somehow to be released. (His exact location was almost certainly not known to the conspirators.) Richard was to be represented, in his absence, by his clerk and double, Richard Maudelyn, who was probably either a half-brother or cousin of the deposed monarch. By one means or another, the plot was revealed to Henry at the last moment. Traison blames Aumale, who accidentally revealed the plot to his father, York. The pair of them then hurried to warn the King, Edward being immediately pardoned. Walsingham merely says that Henry was ‘forewarned’ but does not disclose the method. Another source, Continuatio Eulogii, says that one of the King’s squires picked up the intelligence from a prostitute who had previously slept with someone involved in the plot. A final possibility must be that Elizabeth of Lancaster got wind of her husband’s dealings and sent warning to her brother. Most modern historians tend to dismiss Aumale’s ‘serious’ involvement in the plot. Even so, it is hard to see how he, with his connections, could have remained innocent of what was going on. On the other hand, it must be recognised that many in England (and even more in France!) were deeply suspicious of his motives throughout, and accusations or mutterings of treason against him continued regularly for some years. It is hard to discern how much of this was smoke and how much fire. Be this as it may, the fact remains that Henry and his sons escaped from Windsor with only hours to spare, so whatever warning was received came at the last minute, in true dramatic style. The King’s escape was, in effect, equivalent to the defeat of the conspiracy, as the rebels did not have the forces to match those which Henry was soon to raise from London and the surrounding counties. According to Traison they held the bridge at Maidenhead for some hours, which was probably as good a fight as they could make of it. They also sought to recruit from the various towns and villages they passed, and according to Walsingham also visited Queen Isabelle (Richard’s very young wife) at Sonning, seeking her support and that of her household. Unfortunately, the news that Henry was not far behind them with a large and growing army could not be long concealed, and tended to put a damper on recruitment. The rebels’ retreat rapidly turned into flight, which came to an end at Cirencester, where, exhausted, their ‘army’ camped in the fields while the lords took up lodgings in various inns. What happened next is unclear, but it appears the inhabitants of the town realised that the lords were fugitives, and besieged them in their lodgings. A fire started, and Surrey and Salisbury surrendered, and were initially lodged in the abbey. However, when the townsfolk of Cirencester grasped the measure of the damage done to their town by the fire, they dragged the two lords out again, and summarily executed them without legal authority. Walsingham states that Salisbury, who was a Lollard, refused to make confession before his death. The mystery of Exeter and Gloucester. According to Traison these two lords were at Cirencester, escaped their burning inn by climbing out of the window, and fled in different directions. In the case of Exeter in particular this seems most unlikely. Walsingham states that he remained in London, which makes sense if his role was to raise the Ricardian element among the citizens. Such men were in a minority, but they certainly existed, and if Henry had not escaped they might well have put themselves forward. Exeter was eventually captured in Essex. He was also murdered by the local population without lawful authority, at Pleshey Castle, seat of the late Duke of Gloucester, the uncle Richard II had (possibly) had murdered in 1397. The location was, of course, highly significant. Had Exeter been in Cirencester, he would surely have been wiser to flee towards Devon, where he had extensive land holdings, than eastward, directly into the teeth of Henry’s forces. I therefore conclude it is most unlikely he was at either Windsor or Cirencester. Though, as an experienced warrior and tough fighter he would have been something of an asset if he had been. Thomas Despenser, Earl of Gloucester, is barely mentioned by Walsingham at all, except in the matter of his escape and capture. Again, there is at least a possibility he was not at Windsor or Cirencester and that he never left Cardiff. Indeed, it may be he was guilty of nothing more than misprision of treason at worst. Hearing that the King’s men were on their way to arrest him, he took ship from Cardiff, carrying a considerable amount of portable wealth. However the ship’s captain refused to take him anywhere but Bristol, where the citizens chose to prove their loyalty to Henry by murdering him. If Despenser was indeed innocent of any active involvement in the plot, it might help explain his widow’s bitter hatred of Henry, which culminated in her plot, in 1405, to remove the Mortimer heirs from Windsor Castle and place them in the protection of Owain Glyndwr. Many of the lesser supporters of the plot were assembled at Oxford for trial. Maudelyn, Sir Bernard Brocas and William Feriby were brought to London, to be hanged and beheaded at Tyburn. Sir Thomas Blount and twenty-five others from Cirencester were hanged, drawn and quartered at Oxford. Another thirty-seven received pardons, and at least one, Salisbury’s stepson, was actually acquitted. Roger Walden (the deposed Archbishop of Canterbury), the Bishop of Carlisle and the Abbot of Westminster were all imprisoned for a short time, and Henry Despenser, Bishop of Norwich, fell beneath an uncomfortable level of suspicion, but was not proceeded against. A number of small risings broke out across England in support of the plot, but all subsided with little fuss. The one in Chester was perhaps the most serious and led to a brief siege of the castle. Ironically the man who put it down, the Bishop of St. Asaph, was soon to number among Henry’s enemies as a firm supporter of Owain Glyndwr. As for the widows, Henry treated Elizabeth of Lancaster and Constance of York with considerable generosity – of course they were his sister and first cousin respectively. These two remained very rich ladies indeed, and did superbly well compared to the widows of ‘traitors’ in the Tudor period or even the Yorkist era. The other widows had less kindly provision, although the worst treated of all, the Countess of Wiltshire, had suffered from Henry murdering her husband before he even became king, and had no connection to the plot. In the aftermath of the plot it appears that Henry (and almost certainly his Council) decided that King Richard’s life should be cut short to discourage any further rebellions in his favour. Richard died at Pontefract on 14th February 1400. Various explanations are given, but the most likely seems to be that he was starved to death. Despite this, and the public display of his body in St. Paul’s, rumours that he had escaped and was alive and well in Scotland continued to plague Henry – and indeed his son. That a ‘Richard’ was living at the court of Scotland is an undoubted fact – whether he was the real Richard is quite another matter. The most useful source by far is Chronicles of the Revolution 1397-1400 by Chris Given Wilson. On the trail of the House of York…. Here are eight places associated with members of the House of York. The first is Cerne Abbey, which Anne Neville visited in 1471. Included in the list is my favourite place in all the world, Dartington Hall in Devon.